Real Madrid won the final 3–1 for their third consecutive and 13th overall Champions League title, becoming the first team to achieve three back-to-back titles since Bayern Munich defeated Saint-Étienne in the 1976 European Cup Final; it was additionally their fourth title in five seasons. They also earned the right to play the winners of the 2017–18 UEFA Europa League, Atlético Madrid, in the 2018 UEFA Super Cup and to enter the semi-finals of the 2018 FIFA Club World Cup. They also qualified to enter the group stage of the 2018–19 UEFA Champions League, but since they already qualified through their league performance, the berth reserved was given to the champions of the 2017–18 Czech First League, the 11th-ranked association according to next season's access list. The NSC Olimpiyskiy Stadium was announced as the final venue on 15 September 2016, following the decision of the UEFA Executive Committee meeting in Athens, Greece. This was the sixth European Cup/Champions League final hosted at an Eastern European venue following those in 1973 in Belgrade, Yugoslavia, the 1983, 1994 and 2007 finals hosted by Athens, Greece as well as the 2008 final in Moscow, Russia. The Olimpiyskiy Stadium was built in 1923 and it has been renovated three times, most recently in 2011 in preparation for the UEFA Euro 2012 tournament. The stadium was used as a venue in the 1980 Summer Olympics for its football event and the aforementioned European Championship, including the final match, which saw Spain beat Italy by the record-breaking score of 4–0 on the way to their third title. Its current capacity is 70,050 and it is used by the Ukraine national football team, Dynamo Kyiv, and major domestic matches like the Ukrainian Cup. Defending champions Real Madrid reached a record 16th final after a 4–3 aggregate win against German side Bayern Munich, knocking them out of the competition for the second consecutive season. This was Real Madrid's third consecutive final, and fourth final in five tournaments with an opportunity to win a record 13th title. Previously they won finals in 1956, 1957, 1958, 1959, 1960, 1966, 1998, 2000, 2002, 2014, 2016 and 2017; and lost in 1962, 1964 and 1981. This was also their 20th final in all seasonal UEFA competitions, having also played in two Cup Winners' Cup finals (losing in 1971 and 1983) and two UEFA Cup finals (winning in 1985 and 1986). Real Madrid are only the third team since the competition's rebranding as the Champions League to reach three consecutive finals after Milan in 1995 and Juventus in 1998. They were the first team in the Champions League era, and the fourth overall, to win three straight finals, a feat only achieved by the Real Madrid side of the 1950s, as they went on to win a record five successive finals, as well as the Ajax and Bayern Munich squads of the 1970s in 1973 and 1976, respectively. Liverpool reached their eighth final, their first since 2007, after a 7–6 aggregate win against Italian side Roma. They had won the final on five occasions (1977, 1978, 1981, 1984 and 2005), and lost twice (1985 and 2007). This was also their 13th final in UEFA seasonal competitions, having played in one Cup Winners' Cup final (losing in 1966) and four UEFA Cup/Europa League finals (winning in 1973, 1976 and 2001; and losing in 2016). Liverpool were the first team since Bayern Munich in 2011–12 to reach the final having qualified for the competition through the play-off round. This was also the most recent occasion the final featured an English team (Chelsea). Liverpool were the most recent team to defeat Real Madrid in a European Cup Final, winning 1–0 in Paris in 1981. Besides the 1981 final, the two teams had played each other four times in the Champions League era. Liverpool won both matches in the 2008–09 UEFA Champions League round of 16 (1–0 away and 4–0 at home), while Real Madrid won both matches in the 2014–15 UEFA Champions League group stage (3–0 away and 1–0 at home). 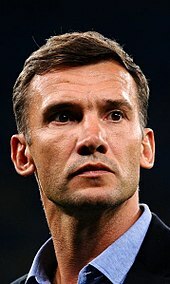 Andriy Shevchenko was named as the ambassador for the final. The ambassador for the final was former Ukrainian international Andriy Shevchenko, who won the UEFA Champions League with Milan in 2003. With a stadium capacity of 63,000 for the final, a total of 40,700 tickets were available to fans and the general public, with the two finalist teams receiving 17,000 tickets each and with 6,700 tickets being available for sale to fans worldwide via UEFA.com from 15 to 22 March 2018 in four price categories: €450, €320, €160, and €70. The remaining tickets were allocated to the local organising committee, UEFA and national associations, commercial partners and broadcasters, and to serve the corporate hospitality programme. 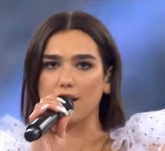 English singer Dua Lipa performed at the opening ceremony preceding the final. Jamaican rapper Sean Paul joined her as a special guest to perform their collaborative song, "No Lie". The 2018 UEFA Women's Champions League Final was held two days earlier, on 24 May 2018, at the Valeriy Lobanovskyi Dynamo Stadium between Wolfsburg and Lyon, Lyon emerging victorious 4–1. This was also the last time that the host city for the men's Champions League final was also automatically assigned the Women's Champions League final. The annual UEFA Champions Festival was held between 24–27 May 2018 at the Kiev city centre. In late May, The New York Times reported that some fans with allocated tickets had returned them after having trouble finding flights to and accommodation in Kiev. Locals in Kiev began offering free accommodation for fans affected by cancelled hotel and apartment arrangements. Several charter flights arranged for Liverpool fans were cancelled, leaving fans with tickets stranded and leading to an unsuccessful search for alternative solutions by the club and city government. Other airlines offered flights to Kiev from airports in Liverpool and Manchester, using assigned slots at Kiev's airports. On 24 May, a group of Liverpool fans were attacked in a restaurant by 20 masked hooligans. On 7 May 2018, UEFA announced that Serbian Milorad Mažić would officiate the final. Mažić has been a FIFA referee since 2009, and gained UEFA's elite referee status in 2013. He was joined by his fellow countrymen, with Milovan Ristić and Dalibor Đurdević as assistant referees, Nenad Đokić and Danilo Grujić as additional assistant referees, and Nemanja Petrović as reserve assistant referee. The fourth official for the final was Frenchman Clément Turpin. The match began with Liverpool's kickoff and the team's successive attacks to counter Madrid's slower, possession-based buildup. In the 23rd minute, a low shot by Trent Alexander-Arnold went through a defender's legs and forced a late save by Keylor Navas. Two minutes later, Liverpool forward Mohamed Salah was injured competing for the ball with Sergio Ramos, who had locked Salah's arm resulting in a fall. Due to a dislocated shoulder, Salah was substituted four minutes later for Adam Lallana. Madrid's Dani Carvajal was substituted in the 37th minute with a hamstring injury after an unsuccessful backheel. Minutes later, Karim Benzema's goal was disallowed after he was determined to be offside while finishing a shot started by Cristiano Ronaldo's header. The first half ended scoreless, with Madrid dominating possession but Liverpool having more chances to score. The first chance of the second half fell to Isco, who hit the crossbar. In the 51st minute, Benzema scored the match's first goal by deflecting a throw by Liverpool goalkeeper Loris Karius back into the net. Liverpool equalised four minutes later with a tap-in by Sadio Mané, who finished a header by Dejan Lovren after a corner kick by James Milner from the right. Gareth Bale was substituted in for Isco in the 61st minute and scored Madrid's second goal two minutes later, using an acrobatic bicycle kick to finish a cross by Marcelo from the left. Liverpool pressed for a second equalising goal, with a shot by Mané that hit the goal post and calls for a penalty for an alleged handball, but were also losing possession to Madrid. Ronaldo had a chance to score his first goal of the match during a counterattack in the 73rd minute, but was tackled by Liverpool defender Andrew Robertson in the penalty box. 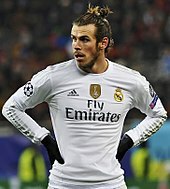 Bale scored his second goal of the match in the 83rd minute on a 40-yard (37 m) shot that swerved in front of Karius and went through his hands and into the net. A second chance on goal for Ronaldo in the 93rd minute of play was interrupted by a pitch invader, who was captured by stadium stewards. The "home" team (for administrative purposes) was determined by an additional draw held after the semi-final draw, which was held on 13 April 2018, 13:00 CEST, at the UEFA headquarters in Nyon, Switzerland. Real Madrid became the first team since Bayern Munich in 1974–76 to win three consecutive UEFA Champions Leagues or European Cups. The title was Madrid's 13th, another Champions League record, and their fourth in five years. Real Madrid's victory was the fifth consecutive title for a Spanish side in the Champions League, becoming the longest run for the trophy to be held by teams from the same country since English sides won six consecutive titles between 1977 and 1982. Manager Zinedine Zidane became the first to win three consecutive Champions League titles and matched Carlo Ancelotti's record of Champions League era wins. Five days after the final, Zidane announced that he would step down as manager in favour of a "different voice". Cristiano Ronaldo became the first player to win the Champions League five times, surpassing the record set by Clarence Seedorf in 2007 and by Andrés Iniesta in 2015. Gareth Bale became the first substitute to score two goals in a Champions League final and was named man of the match. His first goal received acclaim as one of the best in Champions League history and was compared to Ronaldo's bicycle kick goal against Juventus in the quarter-final and manager Zinedine Zidane's goal in the 2002 final. Sergio Ramos's tackle on Mohamed Salah received mixed reactions from the press and fans on whether the injury was the result of a deliberate blow or an accident. Egyptian fans responded with anger on social media, including insults that became trending topics on Twitter. A Change.org petition calling on UEFA and FIFA to punish Ramos for the challenge received 400,000 signatures within two days. A separate incident involving Ramos and Liverpool goalkeeper Loris Karius raised questions after a video showed him allegedly elbowing Karius in the face prior to his first goalkeeping error. UEFA declined to take action against Ramos for the incident with Karius. After an examination, on 4 June 2018, physiatrist Ross Zafonte at the Massachusetts General Hospital said in a statement that Karius suffered a concussion during the match and that, according to him, it was possible the concussion would affect the player's performance. Liverpool manager Jürgen Klopp lost his sixth of seven major finals, including Champions League and league cups. After the match, Loris Karius tearfully apologised to Liverpool supporters who remained in the stands and stated that his mistakes "lost the team the final". After the match, Karius received online death threats and hate messages directed at him and his family. He would move to Turkish club Beşiktaş on loan the following season. ^ a b "Bale named Champions League final man of the match". UEFA.com. Union of European Football Associations. 26 May 2018. Retrieved 26 May 2018. ^ a b c d e f "Milorad Mažić to referee Champions League final". UEFA.com. Union of European Football Associations. 7 May 2018. Retrieved 7 May 2018. ^ a b "Full Time Report Final – Real Madrid v Liverpool" (PDF). UEFA.com. Union of European Football Associations. 26 May 2018. Retrieved 26 May 2018. ^ a b c "Tactical Line-ups – Final – Saturday 26 May 2018" (PDF). UEFA.com. Union of European Football Associations. 26 May 2018. Retrieved 26 May 2018. 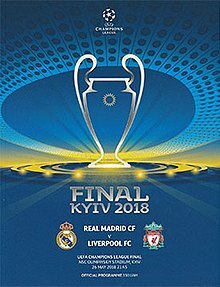 ^ a b "Kyiv to host 2018 Champions League final". UEFA.com. Union of European Football Associations. 15 September 2016. Retrieved 15 September 2016. ^ "All you need to know about the Champions League final". UEFA.com. Union of European Football Associations. 2 May 2018. ^ "Madrid v Liverpool: meet the Champions League finalists". UEFA.com. Union of European Football Associations. 2 May 2018. ^ "Evolution of UEFA club competitions from 2018". UEFA.com. Union of European Football Associations. 26 August 2016. ^ "Who is in the 2018/19 Champions League group stage?". UEFA.com. Union of European Football Associations. 26 May 2018. ^ "1972–73 season". UEFA.com. Union of European Football Associations. 2 May 2018. Retrieved 2 May 2018. ^ "1982–83 season". UEFA.com. Union of European Football Associations. 2 May 2018. Retrieved 2 May 2018. ^ "1993–94 season". UEFA.com. Union of European Football Associations. 2 May 2018. Retrieved 2 May 2018. ^ Harrold, Michael (24 May 2007). "Inzaghi inspires Milan to glory". UEFA.com. Union of European Football Associations. Retrieved 2 May 2018. ^ "2007–08 season". UEFA.com. Union of European Football Associations. 2 May 2018. Retrieved 2 May 2018. ^ "Kyiv opens host stadium for Euro 2012 final". Kyiv Post. 9 October 2011. Retrieved 2 May 2018. ^ "FIFA Technical Report – 1980 Olympics Football Tournament" (PDF). FIFA. 1980. Retrieved 2 May 2018. ^ "Spain 4 Italy 0 Match Report". Guardian UK. 1 July 2012. Retrieved 2 May 2018. ^ "Facts & Figures". NSC Olimpiyskiy Stadium. Archived from the original on 12 July 2012. Retrieved 26 May 2018. 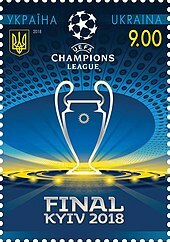 ^ "2018 UEFA Champions League final: Guide to Kyiv". UEFA.com. Union of European Football Associations. Retrieved 26 May 2018. ^ Saffer, Paul (1 May 2018). "Three in a row: Real Madrid making final history". UEFA.com. Union of European Football Associations. ^ Grez, Matias (2 May 2018). "Liverpool see off spirited Roma to reach Champions League final". CNN. Retrieved 26 May 2018. ^ "Club facts: Liverpool". UEFA.com. Union of European Football Associations. 2 June 2017. Retrieved 26 May 2018. ^ Johnston, Neil (2 May 2018). "Roma 4-2 Liverpool". BBC Sport. Retrieved 26 May 2018. ^ Corrigan, Dermot (25 May 2018). "Champions League final repeat of 1981 shows tables have turned at Madrid, Liverpool". ESPN. Retrieved 26 May 2018. 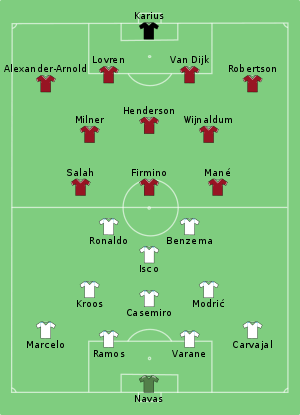 ^ "Real Madrid v Liverpool: detailed head-to-head". UEFA.com. Union of European Football Associations. 3 May 2018. ^ "All you need to know about the Champions League final". UEFA.com. Union of European Football Associations. 2 May 2018. Retrieved 3 May 2018. ^ "2018 UEFA Champions League final ticket sales launched". UEFA.com. Union of European Football Associations. 16 March 2018. ^ "Sean Paul returns to stage after father's death". www.loopjamaica.com. Retrieved 29 May 2018. ^ Wrack, Suzanne (24 May 2018). "Lyon sweep to Women's Champions League win over 10-player Wolfsburg". The Guardian. ^ "Lyon beats Wolfsburg 4-1 to win Women's Champions League". St. Louis Post-Dispatch. Associated Press. 24 May 2018. Retrieved 26 May 2018. ^ "UEFA Champions Festival in Kyiv during final week". UEFA.com. Union of European Football Associations. 17 May 2018. ^ Smith, Rory (20 May 2018). "Why Was My Room Canceled? A Final Overwhelms Kiev". The New York Times. p. D1. Retrieved 22 May 2018. ^ "Champions League final: Fans gather in Kiev after flight cancellations". BBC. 26 May 2018. Retrieved 26 May 2018. ^ "Liverpool mayor 'gutted' after Kiev flights cancelled". Sky News. 26 May 2018. Retrieved 26 May 2018. ^ Calder, Simon (25 May 2018). "Champions League final 2018: What went wrong with cancelled flights to Kiev?". The Independent. Retrieved 26 May 2018. ^ a b c d Taylor, Daniel (26 May 2018). "Real Madrid win Champions League as brilliant Bale sinks Liverpool". The Guardian. Retrieved 26 May 2018. Ramos had locked Salah’s right arm and turned him, judo-style, as they lost balance going for the same ball. ^ a b c Smyth, Rob (26 May 2018). "Real Madrid v Liverpool: Champions League final 2018 – live!". The Guardian. Retrieved 26 May 2018. ^ Price, Glenn (26 May 2018). "Liverpool's Mohamed Salah, Real Madrid's Dani Carvajal injured in Champions League final". ESPN. Retrieved 26 May 2018. ^ a b McNulty, Phil (26 May 2018). "Real Madrid 3-1 Liverpool". BBC Sport. Retrieved 26 May 2018. ^ a b c Smith, Rory; Das, Andrew (26 May 2018). "Real Madrid Beats Liverpool in Champions League Final on a Wonder and Two Blunders". The New York Times. Retrieved 26 May 2018. ^ "Semi-final and final draws". UEFA.com. Union of European Football Associations. ^ a b c "Team statistics" (PDF). UEFA.com. Union of European Football Associations. 26 May 2018. Retrieved 26 May 2018. ^ "Has one league ever dominated European football like La Liga?". The Guardian. 22 May 2018. Retrieved 4 June 2018. ^ "Zidane reaches more milestones in Kyiv". UEFA.com. Union of European Football Associations. 26 May 2018. Retrieved 26 May 2018. ^ "Zinedine Zidane: Real Madrid boss stands down five days after Champions League win". BBC Sport. 31 May 2018. Retrieved 31 May 2018. ^ "Ronaldo first to win five Champions League titles". UEFA.com. 26 May 2018. Retrieved 27 May 2018. ^ "Bale named Champions League final man of the match". UEFA.com. 26 May 2018. Retrieved 26 May 2018. ^ "Real Madrid v Liverpool – Story of the match". BT Sport. Press Association. 26 May 2018. Retrieved 26 May 2018. ^ Winter, Lewis (26 May 2018). "Gareth Bale goal: Real Madrid hero makes Zidane and Ronaldo comparison on Liverpool strike". Daily Express. Retrieved 26 May 2018. ^ Walsh, Kristian (26 May 2018). "Football world split on Mohamed Salah injury - and whether Liverpool should blame Sergio Ramos". Liverpool Echo. Retrieved 26 May 2018. ^ Ellingworth, James (26 May 2018). "Salah's World Cup in doubt as Egyptians turn on Ramos". The Washington Post. Retrieved 26 May 2018. ^ "400,000 sign petition for Sergio Ramos to be banned for Mohamed Salah injury". ESPN. 28 May 2018. Retrieved 28 May 2018. ^ "Champions League final Extra Time: Pitch invader stops Ronaldo, Should Ramos have been sent off?". News.com.au. News Corp Australia. 27 May 2018. Retrieved 26 May 2018. ^ Hunter, Graham (27 May 2018). "Real Madrid's historic Champions League title obscured by online outrage". ESPN. Retrieved 28 May 2018. ^ "Real Madrid's Sergio Ramos to face no action for Loris Karius clash - UEFA". ESPN. Associated Press. 29 May 2018. Retrieved 29 May 2018. ^ "Liverpool goalkeeper Loris Karius suffered concussion in Champions League final". ESPN. 4 June 2018. Retrieved 4 June 2018. ^ "Loris Karius apologises to Liverpool for Champions League horror show: 'my mistakes lost us the final'". The Independent. 26 May 2018. Retrieved 26 May 2018. ^ Crisp, Wil (27 May 2018). "Police investigating death threats issued to Liverpool goalkeeper Loris Karius". The Telegraph. Retrieved 27 May 2018. ^ "Loris Karius: Liverpool goalkeeper joins Turkey's Besiktas on loan". BBC Sport. 25 August 2018. Retrieved 25 August 2018.